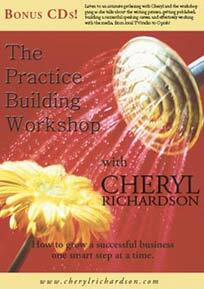 Are You Ready To Build a Thriving, Referral-Generated Practice? Rather than focus on hundreds of marketing techniques, this program will help you nail down the necessary (and smart!) steps to build and grow a successful business that reflects your unique personality and talents. 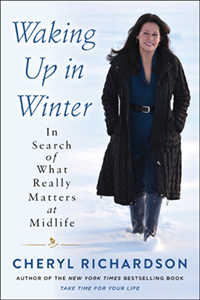 As they travel throughout North America and Europe together, Louise and Cheryl discuss a wide range of topics, including the importance of loving ourselves and our bodies; aging consciously; bringing true prosperity and abundance to the world; manifesting positive relationships-both with family and friends and in the workplace; and facing death in a dignified and peaceful way. In the rush of everyday life we can often lose sight of our own well-being and inner comfort, to the point where we lose sight of how to bring deep pleasure into every day. In this short, easy-to-read guide, world-renowned life coach Cheryl Richardson shows you how to nurture life’s most important relationship: with yourself! As each chapter challenges you to alter one behaviour or circumstance that holds you back, you’ll learn how to understand the true impact of your surroundings, accept disappointments in all areas when they arise, find your natural rhythm and ride life’s waves, and discover your passions and strengths to get the best out of your life. With sound advice, effective exercises and resources to take each step further, this practical handbook for the heart and mind will show you that by changing your mindset, you can radically change your life in just 21 days. On this remarkable DVD set, Louise Hay and Cheryl Richardson share spiritual tools you can use to create a life that honors your soul. As you use this program, you’ll marvel at the way you’re developing a gentle, more loving relationship with yourself-a relationship that will reward you with the life of your dreams! For countless people, the words of Louise Hay have served as a beacon, leading them out of the darkness of despair and into the light of a better life. Cheryl Richardson is one of the many individuals whom Louise has greatly influenced…before going on to become a best-selling author herself. 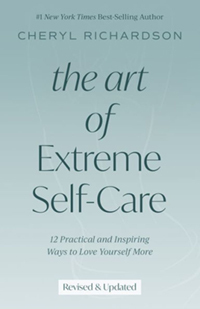 Learn more about The Art of Extreme Self Care – Read the Intro!